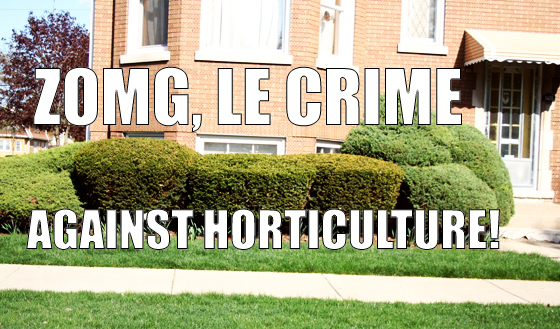 Last month, In the Garden Online had an excellent take-down of the forced “crimes against horticulture” meme. Blooming Writer also chimed. What is it about the whimsical and crazy-looking pruned trees and shrubs that inspire such disdain among certain groups? Elitism. I don't get it. But then again I like topiary, and I think it is art. It may have something to do with my love of Pear Fryar that HGTV instilled in me way back when the station was about gardening. I would pay good money to see someone tell Pearl Fryar to his face that what he does is a “crime against horticulture.” Sure, every landscape crew isn't filled with Pear Fryars, but is there really that big of a difference between what the gardener featured by the likes of Martha Stewart an the Gates Foundation does and what the landscapers mocked by elitist garden writers? If you have ever wondered how those meatball-shaped shrubs at your garden center get made these videos will be pretty cool. Gebroeders Ezendam B.V., a Dutch company, manufactures pruning machines for plant nurseries to achieve those perfectly crafted meatballs, standard topiaries, and cones. Some serious technology is used to precisely groom these shrubs, and then uproot them and get them ready for the consumer. Their Globus machine trimmer can clip 600 balls an hour, and they reportedly have a model that can do 5000 an hour. So the next time you pass by a whimsically pruned boxwood or juniper don’t blame the “plant janitors” for the crimes committed against horticulture by robots. I for one welcome our robotic landscape overlords. Click the link below for more robot landscaping vids. Pearl Fryar's garden is on my bucket list. I also wrote a while back about a quirky topiary garden in our town that I know has at least a few of its neighbours sneering. I can send you a link if you want. However, in mild defense of the CAH meme, I think it began with good intentions, but got out of hand. There's topiary (and I have a high Quirk Quotient), and then there's mangling of a tree or plant that does it harm. I'm taking it all with a large pinch of salt or few. Things on the internet tend to turn snowballs into avalanches. Mine too. He was in Chicago last year doing a demo and talk at the African American history museum, and I regret not taking them up on the invite to meet him. Whatever I was doing that weekend was not as important as getting to meet one of my fave gardening personalities. Ugh. I was so stupid. Please do send me the link to your post on the topiary garden. can't find it again but, there was a wonderful topiary of a huge face carved into a hedge next to a castle in Scotland. At first you don't see it, then, the face watches you. I am also fond of such beautiful and artistic topiary.